TSUBAKI KABELSCHLEPP has released the TKK series a new cable carrier for small installation spaces in harsh conditions, as required for example with lifting device. TKK39 is self-cleaning, extremely stable, while remaining light and compact. It delivers particularly high torsional rigidity and supports long unsupported travel of up to 5 metres. The space-saving design of the TKK39 impresses with, among other things, its installation height of only 142 mm – in comparison to alternative solutions, TSUBAKI KABELSCHLEPP was able to reduce the installation height by 65 %. The energy chain can be used when both self-supported and gliding. It supports speeds of up to 3 m/s and accelerations of 9 m/s2. Short steel connecting elements allow for swift and easy assembly – they are directly bolted onto the console or support. The chain links are made entirely of plastic, whereby TSUBAKI KABELSCHLEPP also offers hybrid chains with aluminium stays and steel chains as an alternative to this particular weight-optimized version. “Our new TKK series was specifically designed for use in lifting devices, areal lifts and platforms,” explains Werner Eul, Product Manager Cable Carrier Systems at TSUBAKI KABELSCHLEPP. “Due to the compact arrangement of the telescopic boom, large extension lengths are possible and the high torsional rigidity provides a straight extension.” These properties have a positive effect in other application areas: For example, in agricultural, municipal and construction machinery, in drilling or in the cement industry. “In general, the TKK39 proves itself wherever harsh environmental conditions meet limited design space and good lateral stability and torsional rigidity are required,” says Eul. In lifting devices, energy chains in an external arrangement are exposed to the weather conditions and, depending on the application, can be affected by dirt or falling objects. To ensure smooth operation despite these difficult conditions, the cable carriers of the TKK series are equipped with a dust, dirt and chip-proof stroke system as standard. The dirt simply runs off the very smooth surface. 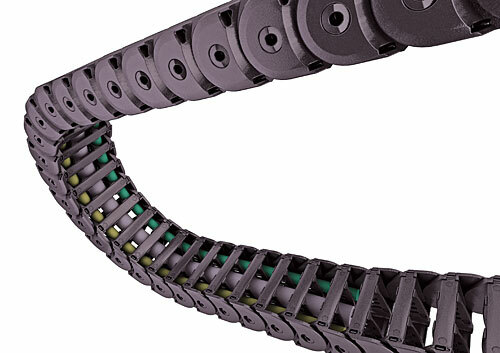 Also the energy chain is self-cleaning in movable applications: Specially installed bevels break up the dirt so that it can then be discharged – a compacting or caking is therefore avoided. The divider construction of the TKK39 is also ingenious: The cable carrier is equipped with lockable brackets for optimal cable protection which swivel inwardly at any position depending on the stay variant. Dividers which are adjustable or fixable in 2 mm increments together with a flexible height separation made of plastic or aluminium enable optimal separation of the cables.